Kids can garden, too! It might seem that gardening is too complicated for kids, but that isn't true at all. In fact, kids can be some good horticulturists if given the chance. There are several plants that grow well in Denver and are easy for kids to garden and maintain. 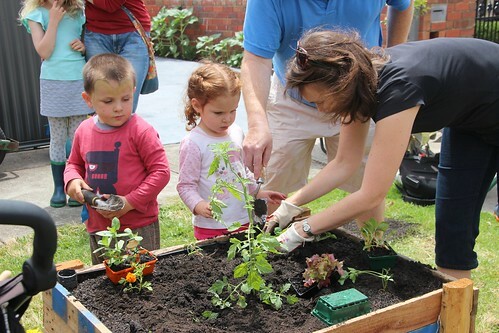 Start kids out in gardening with the easiest plants and let them work their way up from there. Before getting your Denver kids gardening, be sure they have the essential supplies. Suggested gardening supplies include tools, gloves, proper soil and food for the plants, a child-sized wheelbarrow and desired garden decorations. Denver soil is more like clay, so a good organic garden soil is recommended for the best results. Sunflowers are one of the easiest flowers for kids to start out with. They come in various sizes, making them versatile to grow, no matter the size of the garden bed. Sunflowers thrive in the Denver climate, as they can be very hearty. Portulaca, also known as moss rose, is a fun and interesting plant for the kids to grow. The unique shape and texture of this flower delight kids, as do the colors. Portulaca is a good flower to grow in Denver because it blossoms in the sun. Vinca are a favorite of my own kids. These were some of the first flowers they planted and they continue to come up each year. Not only are vinca beautiful, but they grow very fast in Denver. Kids can sometimes be a little impatient, so vinca can help in that area. Our vincas bloom almost the entire year in Denver if we keep them in pots and use good soil. Herbs are very simple to grow in most any climate. They can be grown outdoors or in a window box container. Herbs need good sunlight to grow, which makes them perfect for Denver in the spring and summer. They’ll need to be kept inside during cold weather, however. Another plus is that kids feel special when their parents use the herbs they've grown to make family meals. Green onions often grow wild in Denver, but if your yard doesn't have any, this is one of the simplest plants for kids to grow. Like the herbs, these can grow outside or in a window box. Give the green onions plenty of water and sunshine for the best results. As with the herbs, kids love it when their plants are used in the family cooking. We like to use them in homemade salsa, chili, and other southwestern dishes. Looking for free educational activities for kids in Houston? As a mom to many, who lived and homeschooled in Houston for a while, I discovered lots of great places to go. Here are 5 of the most interesting free educational activities for Houston kids. The Sam Houston Boat Tour is great free activity for kids in Houston. Operated by the Port of Houston Authority, the free educational tour lasts 90 minutes. While on the tour, kids can observe international cargo vessels that may pass by, as well as the operations at the port terminal. While free, reservations for this Houston activity must be made in advance. The Health Museum in Houston contains a variety of educational exhibits for children to explore.This interactive science exploration is for all ages. It focuses on the human body, mind, and spirit, encouraging kids to focus on health. On Thursdays, the general admission is free for families from 2pm - 7pm. At Mercer Arboretum and Botanic Gardens, kids can enjoy the education and beauty of nature. Native and cultivated plants thrive in this 300 acre horticultural museum of life. In addition to learning about the plants by observation, Houston kids also can enjoy the educational benefits of observing the animals that live in this park. Utilize the Kids Workshops at Home Depot to their full advantage. Once per month, the Home Depot locations in Houston offer free workshops for kids, in which they get to learn and build projects that they can use. These educational workshops are not only free of charge, but are a great supplement to homeschool wood shop. They also work as an extracurricular educational activity for Houston kids in both homeschool and traditional school. Free Crafts for Kids are offered every Saturday from 11am - 3pm at Houston Lakeshore Learning Store locations. Yes, crafts are so much fun for kids. But, did you know that they also have educational value? Craft activities can help kids with focus, creativity, and fine motor skills. These skills all are required to complete other educational activities. Houston kids will enjoy creating fun and educational crafts that they can use to decorate their rooms, give as gifts, wear, and more. A different craft is featured every week. *I originally published this as The Houston Parenting Examiner (no longer published there).